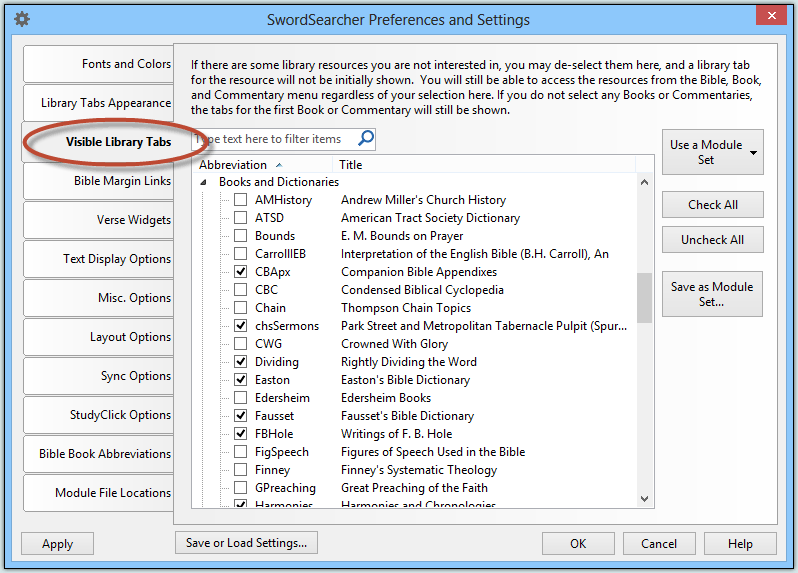 SwordSearcher is designed to make accessing a wide variety of resources simple and straightforward, but using SwordSearcher can be made even more pleasant by taking a few easy steps to hide tabs and links that are rarely used. This is especially helpful if you have a smaller monitor or do not run SwordSearcher maximized. Remember, no matter which study modules are visible with tabs or links, all of them are always accessible on the main menu, under Bible, Book, and Commentary. These tabs can start to take up a lot of space if you have a lot of modules installed. But it's easy to reclaim that space by hiding tabs that you do not frequently use. On the main menu, select the Tabs menu and then Select tabs to show. All you need to do is keep a check mark next to the study modules you want to see tabs for, and clear the checks next to the ones you want hidden. Study modules are categorized under Bibles, Books, and Commentaries. You don't "lose" the study modules by hiding their tabs. They are still available on the main menu and with other menus and links in SwordSearcher. A complete list of all installed modules is easy to access with Select Library Module on the File menu. Also, any time you want to see all of the tabs, you can select Show All Tabs on the Tabs menu (keyboard shortcut Alt+F11). You can switch back with Show Selected Tabs (keyboard shortcut Alt+F12). 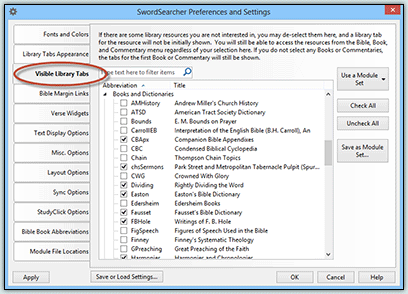 SwordSearcher's Bible Margin is one of its most powerful and unique features. Like the library tabs, how much space it takes up depends on how many study modules you have installed. 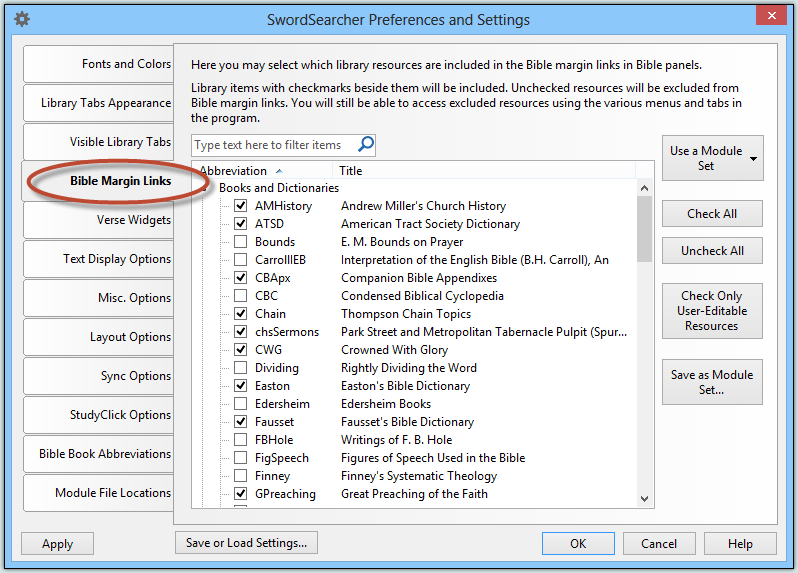 And similarly, you can exclude any library modules from the Bible margin area to save space. 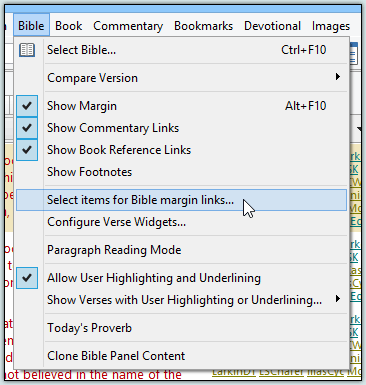 On the main menu, select Bible and then Select Items for Bible Margin Links. All you need to do is clear the check marks next to each Book or Commentary that you do not want included in the Bible margin area. 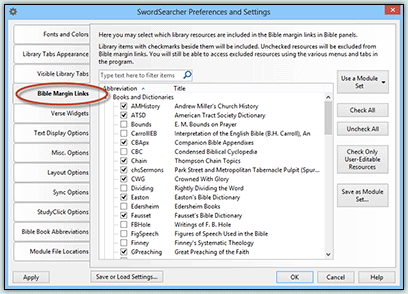 The Bible Margin Links preferences allow you to decide which modules are included in the margin area of the Bible panel. Regardless of the Bible margin link settings, you will always be able to access the entire study library by verse or passage reference with the Verse Guide.